The idea that mitochondria once existed as free living bacteria and that a simple cell engulfed one of these bacterial cells and promptly became a eukaryote cell is a difficult idea to ‘prove’. The fact that this happened millions of years ago doesn't help the science but is a great illustration of the nature of science. This story of a biologist’s tenacity and ingenuity in her research over sixteen years illustrates some important ideas about the nature of science. Read the webpages and answer the questions to gain an insight into the scientific method. Science is a community endeavor - new discoveries depend on a the scientific community. Scientific ideas evolve with new evidence. The scientific method can overcome individual biases. Activity 1: Study the work of Lynn Margulis and her endosymbiosis research? then look at this diagram of 'exploration and discovery' in science. mitochondria dividing in eukaryote cells. 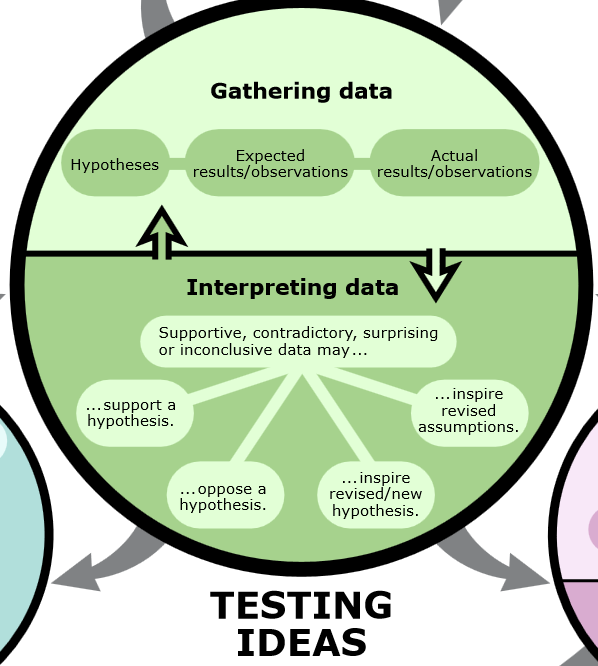 Look at the next part of the diagram of how science works: Testing ideas. Outline the hypothesis which Lynn Margulis stated at the start of her research into endosymbiosis. The hypothesis stated that bacteria experienced several episodes of endosymbiosis which lead to the formation of eukaryotic cells, once for mitochondria, for chloroplasts, and also for flagella (microtubules). In what ways was the scientific community an obstacle to the acceptance of the research? Parsimony - scientists prefer simpler explanations over more complex ones, evolution already explained most observations. Inconsistency with the accepted theory of evolution - the accumulation of small changes is not the same as large changes from a single endosymbiosis. Bias - most scientists working on evolution were focused on large animals. Which parts of the data she collected were supportive of the hypothesis? Mitochondria can reproduce themselves, they contain their own genetic material (DNA) which can code for traits within the mitochondria, a the are free living prokaryote relatives of mitochondria. Which parts of the data were contradictory or inconclusive? The evidence for endosymbiosis of flagella material is not conclusive, the evidence for the presence of DNA or RNA is not strong and does not support the hypothesis of endosymbiosis at present. How did she use evidence which opposed a hypothesis to support her own hypothesis? She found no evidence to support the step-by-step evolution of mitochondria within cells. No cells have been seen with simple forms of mitochondria showing these steps.